If you're a player of any kind, chances are you've picked with a Dunlop pick: one with the ubiquitous Tortex logo, the ever-popular Jazz III shape, or maybe the Gator Grip or USA Nylon variants. You've likely used one of Dunlop's capos, whether it's the Elastic, Toggle, or Trigger models. Or perhaps you have one (or many) of the classic stompboxes—Cry Baby, Uni-Vibe, Fuzz Face, or those from MXR or Way Huge—resurrected by or created under the Dunlop umbrella. Today, it has been reported by Loudwire and other outlets that Jim Dunlop, a pioneer of guitar accessories and the head of his eponymous brand, has died at the age of 82. Dunlop's first popular product was a Toggle capo that he specifically made for 12-string guitars. That led to Berkeley-based luthier Jon Lundberg asking him to build a metal thumbpick like National used to make. It was to be the first in an ever-expanding line of picks that made the reputation of the Dunlop brand. Dunlop's innovative Tortex material brought a new type of plastic to picks, offering a synthetic substitute to real tortoiseshell, which was banned in the '70s. The Jazz III shape, which is now available in Tortex, Nylon, Ultex, Max-Grip, artist signature, and other varieties, was a game changer upon its release. 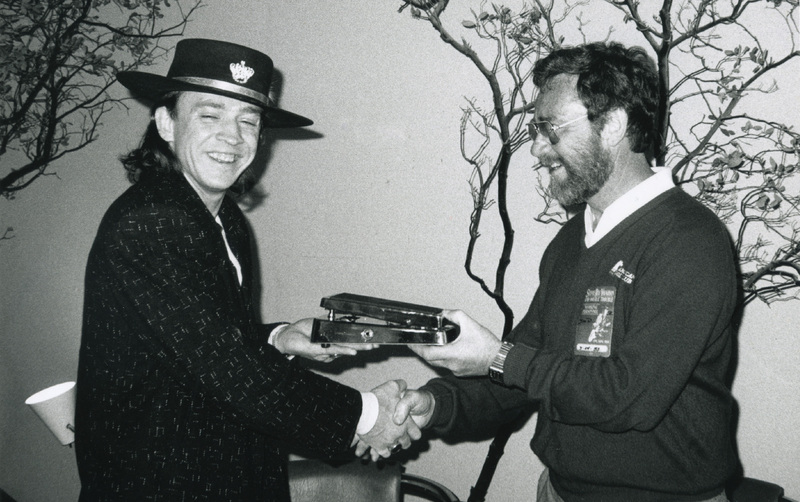 Jim presents blues icon Stevie Ray Vaughn with a rare gold-plated Cry Baby Wah. "One of my biggest thrills is when a really good guitar player enjoys a product that we make," Jim told NAMM in a 2009 interview. "The Jazz III pick that we make has actually had a three-page article written on it and the heading was 'Do You Need to Have One of These to Be a Good Guitar Player?' Well, you don't. But I've really become overwhelmed at the success of that particular pick. It's been copied right, left, and center." Riding the popularity, Dunlop branched out into slides, while continuing his innovations in capos. Jim's resurrection of the Cry Baby wah pedal marked a strong entrance into the effects scene, a huge success that set the tone for the future of the company. Reissues based off of other past classics like the Uni-Vibe, Fuzz Face, and Octavio units followed. Eventually, Dunlop would bring back MXR, with its Phase 90, Dyna Comp Compressor, and others, recreating iconic designs and creating new ones under that name. In the mid-2000s, Dunlop hired Jeorge Tripps, not only to place the MXR line in his hands, but also to resurrect Tripps' own Way Huge brand. From those earliest capos and picks to the wide world of gear now available under the Dunlop name, Jim's legacy among players will live on for years to come. Keep scrolling to read a selection of tributes from across the music industry that Dunlop's fans are posting on social media. The D'Addario family is sending its condolences to @JimDunlopUSA on the loss of their founder, Jim Dunlop Sr.